Next Holy Mass on University of Bath Campus will be after Easter, on Sunday 28th April. If you are in Bath for Holy Week and Easter, then feel welcome to come to services at Ss Peter & Paul, Combe Down where Father Bill OSM is the Parish Priest. 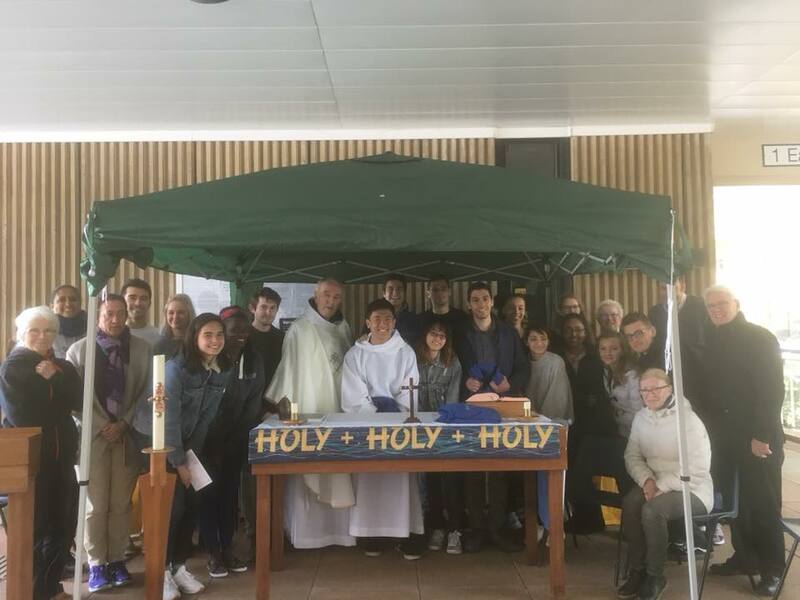 If you need to see the Bath Catholic University Chaplain, Father Bill OSM, he is very often around on Campus at various times throughout the week or just email him. On Wednesday 29th November at Clifton Cathedral, we celebrated Evening Prayer, launching our Diocese of Clifton into a Year of Mission. The Bishop presented students representing Bath Catholic University Chaplaincy with the resource giving, amongst other things, practical ways to enable us to be a Church of Mission. To read more about this Year of Mission, please click on the image above. On Thursdays at 6.30pm for half an hour in the ECC in term time with Father Bill OSM. and also as announced in the newsletter. Drop in for a few moments when you can. This is a quiet time of prayer and praise before the Blessed Sacrament – It is very peaceful and beautiful and usually lasts for half an hour. Join us for the whole time or even for just a few minutes. ​This usually precedes the Cathsoc Evening meetings on Thursdays. Every Thursday meet Father Bill OSM and the other Bath Spa University Chaplains of other denominations for home-made soup, bread and cheese for only £1.50. All profits go to Water Aid. Last year students and staff helped to raise over £1700! The beautiful and powerful devotion of First Friday Adoration of the Blessed Sacrament at Ss Peter & Paul where Father Bill OSM is the Parish Priest, continues on Friday 4th January following on from Holy Mass at 9.30am until Solemn Benediction at 7pm. Please join us at any time during the day for this beautiful devotion of prayer and reflection. Remember - If you are too busy to pray, then you are too busy!!! ​Lifts to the church are available. Summer Reception 2018 - Looking fabulous!! The Sacrament of Confession and Forgiveness is a wonderful gift and gives us many graces. It’s a good idea to go to Confession on a regular basis, but if you haven’t been for a while then don’t be afraid. Remember that it is Our Lord we are speaking to and the Priest will help you. For help with how to 'do' Confession have a look at the Confessions help page. Father Bill OSM is always available to hear your confession before or after Sunday Holy Mass or Monday Lectio, Thursday Adoration or Friday Rosary, or just email him for a mutually convenient time. The Ceilidh was great fun and there was plenty of laughter and making of new friends. Now getting ready for the CathSoc Christmas party on Thursday 6th December. Look at CathSoc Facebook page or Whattapp for more details. Congratulations to Joel our new Catholic! 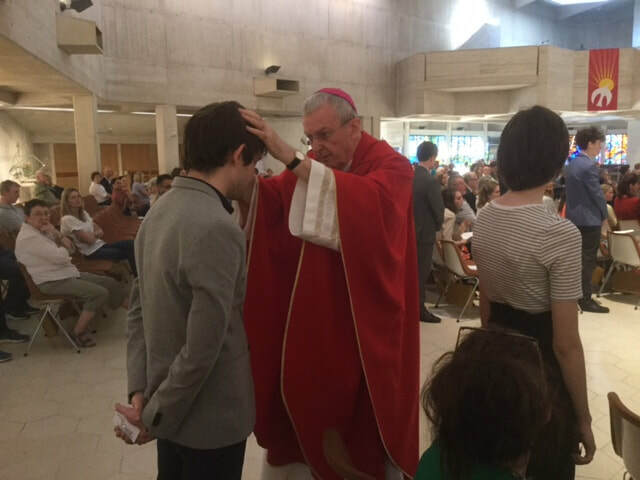 Congratulations to Joel, who was received into full Communion into the Catholic Church on the Feast of Pentecost during Holy Mass in the Ecumenical Chaplaincy Centre on University of Bath Campus. 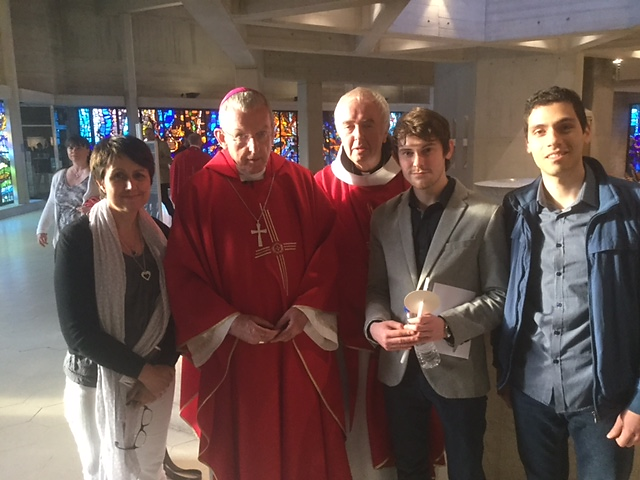 He was also Confirmed with other young people by Bishop Declan. It is an Easter Duty to go to Confession during Lent or at least before the end of the Easter season or by Trinity Sunday. Even if it has been quite a few months or many many years since your last Confession, don't let that put you off from receiving forgiveness from our Lord - The priest will help you and Our Lord will do the rest, so don't panic!! Father Bill is always available for the Sacrament of Confession after Holy Mass or the many times he is on Campus. Just ask him afterwards or email. Every Monday in term time at 6.15pm in the ECC on Campus Open to all. ​Lectio Divina is the prayerful way to read the Scriptures and a way of encountering Christ through a specific way of reading the Bible.